Island visited by 12 members. 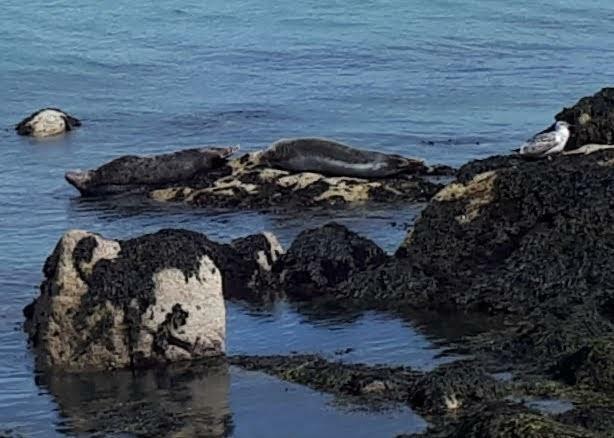 Picture from Maulin : Seals basking in the sunshine! Picture: Seals basking in the sunshine! Every visit to an Island is such a unique experience. There is something magical about stepping off the mainland and being, even for a few hours on another Island. When thinking about visiting an Island, I always consider the following; weather, geography, Journey plan and experience. Dalkey Islands are comprised of Dalkey Island, Lamb Island and Maiden Rock. The only access to Maiden Rock, located to the West of the Islands, is by sea. Lamb Island is located North West of the main Island. It can be accessed on foot at low tide from the mainland. I live in Dublin. Dalkey Island is very accessible but I had been putting it on the long finger. During the last week of August in 2018 I was keeping an eye on the weather. It was glorious. It was forecasted to get up to 21 degrees. I choose Sunday, 2nd September to visit Dalkey Island. Dalkey Island is 300 meters off the mainland and 3km south of Dun Laoghaire Harbour. The highest point on the island is just over 24 metres above sea level. It was an important site of Pilgrimage for centuries. It has been known as ‘St Begnet’s Isle’ since records began. Today it is named after the nearby village of Dalkey.The Island is uninhabited. There is evidence of human occupation dating back to the Neolithic period. The remains of field systems, a church (named for St. Begnet), a ‘cairn’ burial, a gun battery, the Martello Tower and two holy wells still exist. A few days before going to Dalkey Island I found and made contact with Ken, The Ferryman. Ken is a native of Dalkey and for €8 brought me over and back. www.kentheferryman.ie We arranged to meet at Coliemore Harbour at 11am. It is also possible to visit the Island from Bulloch Harbour. Both Harbours are located close to Dalkey village. The boat journey was less than 10 minutes and very pleasant. Ken told me some stories about what it was like growing up in the area. I had driven to Colimore Harbour, however, in hindsight, it would have been better to have taken public transport (DART or Bus). Dalkey village and all along the harbour get very busy. Especially in glorious weather and so it took some time to find a parking spot. There were only a few other people on the Island when I arrived. It is a small Island and easy to walk around. There really are beautiful views at every step of the way and much to see such as Howth Peninsula, Muglins lighthouse, the Martello Tower and Church. There are no shops, pubs or restaurants on the Island. The biggest difficulity I had was to choose a spot from all the beautiful ones available to sit and eat my packed lunch. I finally settled on a spot looking at wild goats grazing a few feet from me and seals basking in the sunshine.